Today I want to try my first CTF walkthrough. I choose the relatively new Basic Pentesting 1 VM from Vulnhub. 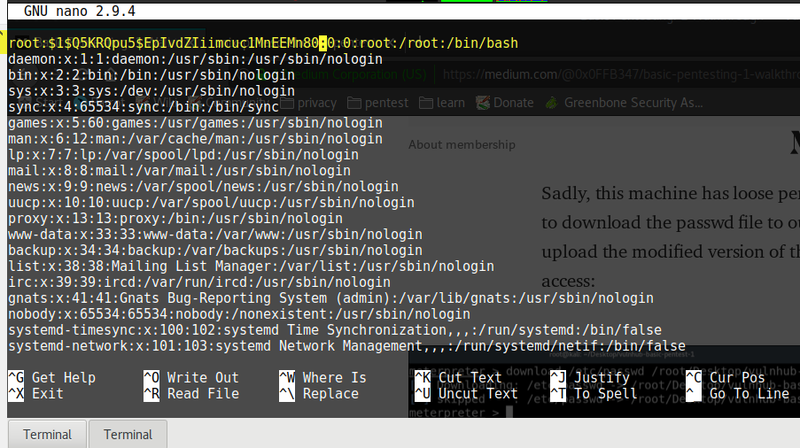 This CTF is aimed towards beginners and the goal is to get root privileges (boot2root) on the machine. I will take you with me through my workflow, I consider myself a beginner when it comes to CTF’s as well, so this will be interesting for me. I won’t explain how you can set up the VM and stuff like this, this is only a walkthrough. The first thing I usually like to do is running an OpenVAS scan against the target. This is sometimes more and sometimes less effective. This time it straight up revealed our first vulnerability: A nice little ProFTPD Backdoor. Learn how to use search filters in Metasploit! This looks promising. Let’s try to exploit it with Metasploit. Bingo! Found something. Let’s set the target’s IP. Alright, now that we have 1 root access, I have a feeling that everything get’s far more complicated from here. Next thing I did was running a Zenmap scan against the target. Naturally, the first thing we try to do is opening a web browser and trying to access the on port 80. Hm… Nothing here. 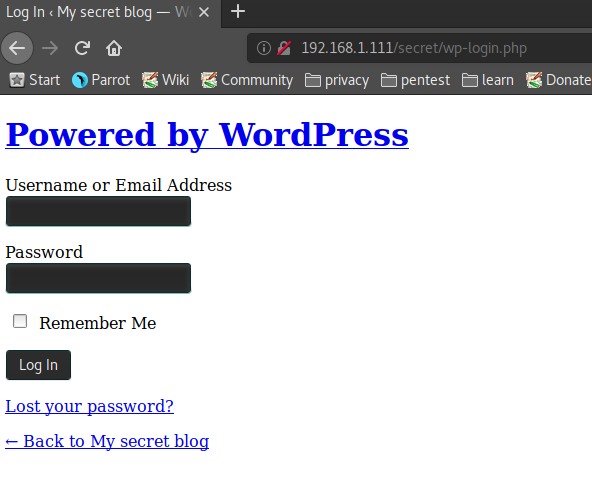 I also tried the typical /wp-admin login to see if there is a WordPress installation present. Also negative. I also tried /robots.txt but nothing there either. I have a feeling that there is something hidden tho. Why would there be Apache running if nothing is on it? Let’s dig deeper. Next thing I did was running Uniscan against it. Check out the results below. Interesting. This reveals a URL that we might want to have a deeper look at. That smells like there is some WordPress going on there. Let’s go check the URL first. And sure enough, http://192.168.1.111/secret/ reveals a WordPress installation! 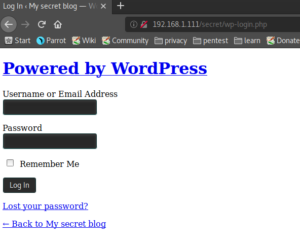 And a test of http://192.168.1.111/secret/wp-login.php reveals a WP-Login page. Bingo! Now the fun can begin. Alright, we are a big step further now. 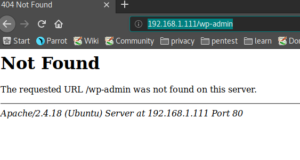 The first thing I want to do now is run WPScan against the site to enumerate potential users and find potential vulnerabilities. [+] Interesting header: LINK: <http://vtcsec/secret/index.php/wp-json/>; rel="https://api.w.org/"
But first, let’s run a user enumeration with WPScan. Admin as a username… Why not try admin/admin? Huh? Entering Username and Password redirects us somewhere else, a domain. That’s weird. Let’s figure out what’s up with that. However, if we replace http://vtcsec/ with http://192.168.1.111/secret/index.php/2017/11/16/hello-word/ we are able to access the site. I don’t know where this will lead us yet but it’s good to know. 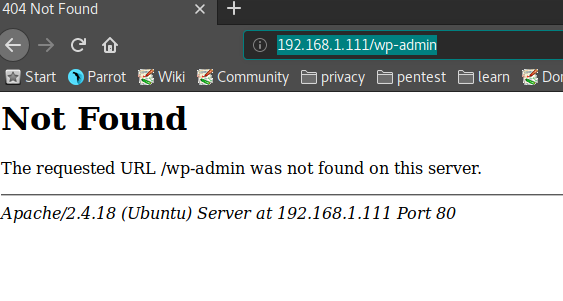 Now to be able to run a brute-force attack against the WordPress site without error, we need to add 192.168.1.111 pointing to vtcsec into our hosts file. We can verify if that worked by clicking on a link on the http://192.168.1.111/secret/ site again. And there we go, hit F5 to refresh the page and it starts loading correctly. 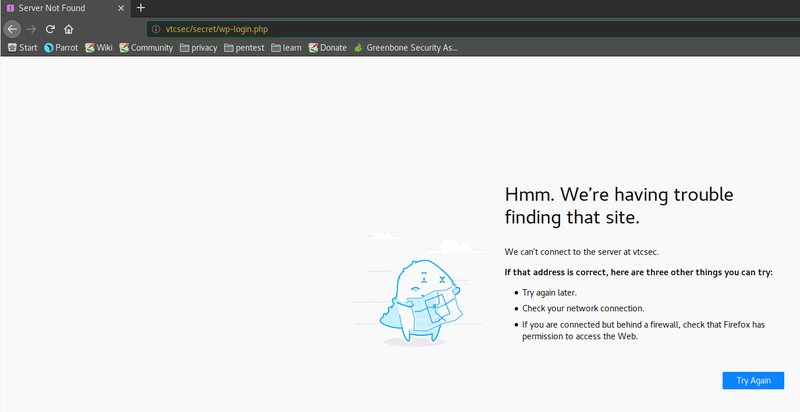 Remember my previous attempt at using admin/admin as a username, where we got redirected to a page not found? Well, I tried it again and look there, the login is admin/admin. We now have access to the Admin Dashboard which gives us a host of new things to try. But not so fast, what if the password wouldn’t have been admin/admin? We could have used wpscan to brute-force a couple of default passwords against it by running the command below. I used the http_default_pass.txt wordlist and it, sure enough, found the correct password as well. Now I went to Appearance -> Editor -> Theme Header(header.php) in WordPress. I pasted the code at the bottom of the file and changed the IP to my attacking computer. You can delete the code that was in the file before. Also, I changed the port for good measure. Now I updated the file. Next, I need to start a listener on my attacking computer. 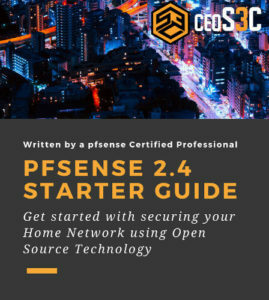 Once that is done, you just open http://http://vtcsec/secret/ once more and you will see that we get a connection on our listener. We are logged in as the www-data User. Now let’s see if we can leverage this to gain Root access. Quick answer: I couldn’t. 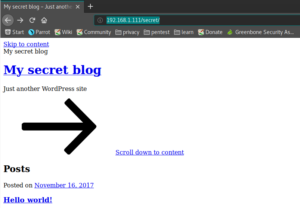 I wasn’t able to elevate my www-data user to higher privileges, so I googled Metasploit + WordPress + plugin, because I knew that I probably have better chances by using a Meterpreter shell and that I have admin access to WordPress, so there should be a way to upload a malicious plugin, and there was. 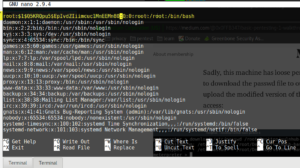 The Metasploit Admin Shell Upload module sounds promising. Firing up Metasploit and configuring the module first. We are still the www-data user, but at least we are able to use some advanced commands with Meterpreter vs. the shell we had before. Now we will utilize the unix-privesc-check script to see if we can find something. I downloaded the file and placed it in my /var/www/html folder on my ParrotSEC OS. After this, I started apache2. Now we got a proper shell. We need to go to the tmp folder to be able to download the privesc file with wget. Now we make the file executable and run it. And analyzing our file, one thing catches my eye immediately. That should enable us to change the root password somehow. A little research showed that I have to create a new password hash using OpenSSL. First I went back to the Meterpreter shell by typing exit twice. Now I downloaded the passwd file. Back to the Meterpreter shell and re-uploading the new passwd file. And boom, root access! I have to say, this costs me a lot of research. The key was the privilege escalation script and spending a lot of time searching how to change the password in the passwd file. 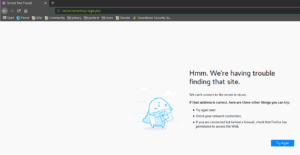 This is all I was able to find by myself, there is one more way to gain root access that I learned from another Walkthrough: MySQL credentials that be found in /var/www/html/secret/wp-admin/wp-config.php , but I wasn’t able to figure that out myself. This CTF was a hell of a lot of fun and I highly recommend it for beginners. Working on CTF’s really is beneficial to develop a proper workflow and thinking patterns. on my machine the website is already sorted without editing host file…why so ?? 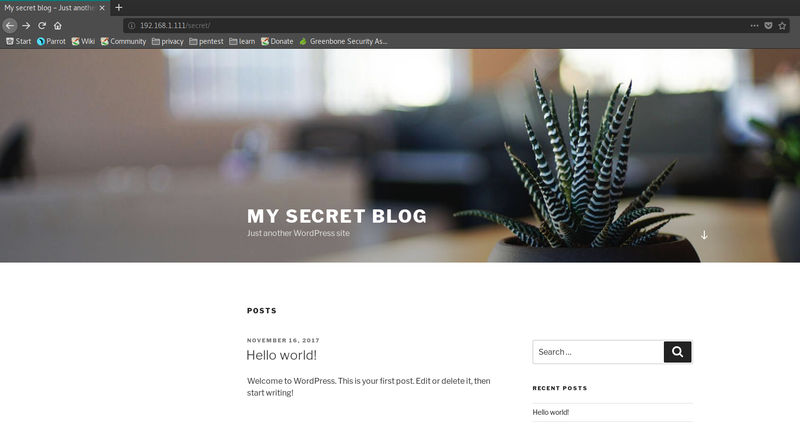 Quick question, why weren’t you able to gain privileged access after using the php shell on the wordpress site? You should be able to edit the passwd file just as you did on meterpreter with the www-data user, and „su -“ after changing it, without metasploit at all.